I am pleased to announce that local hotelier Pravin Patel has been cleared to begin restoration of the hotel, lobby and retail spaces at the historic Brookdale Lodge. Mr. Patel purchased the property in 2015, envisioning returning the Lodge to its former glory as a regional destination and source of community pride in the San Lorenzo Valley. He has been working closely with the Santa Cruz County Office for Economic Development to obtain permits necessary to reopen the hotel and several shops. I know that people in the San Lorenzo Valley and far beyond have been eagerly looking forward to the re-opening of this beloved landmark. The County fully supports Mr. Patel’s endeavor, and I personally can’t wait to visit once the project is completed. Work is currently underway to renovate 46 rooms separate from the main lodge, and a rear apartment section damaged in a 2009 fire has been removed. Mr. Patel foresees the return of a coffee shop, grocery store and other service-oriented business to the hotel, which had previously offered the few retail options available to Brookdale residents. The famous Brook Room, with a creek running through the middle of several dining levels, remains intact and will be subject to a later phase of renovation, as will the former Grover Lumber Mill lodge building and the cabins located east of Highway 9. Mr. Patel also hopes to reestablish the lodge as a destination for weddings, church groups, reunions and more. He is asking those with personal photos of the exterior or the interior to post them on social media (Facebook, Twitter, Instagram, etc.) 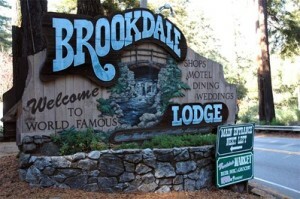 with the hashtag #BrookdaleMemories.